Hello new week, what better way to start you off than to show an FO? Yes, I quite like that idea. So let's get to it, shall we? Chop, chop! 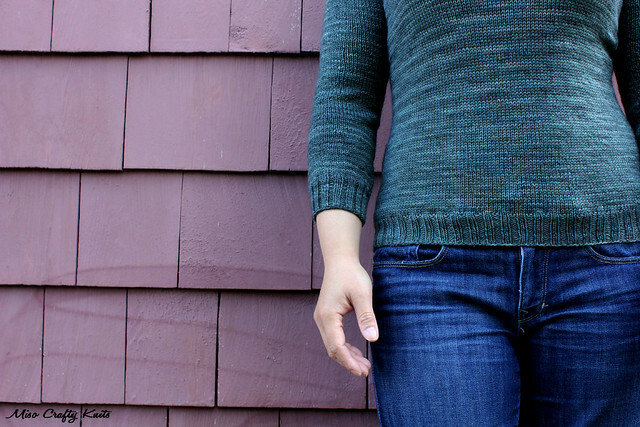 This here is my Buckwheat pullover. 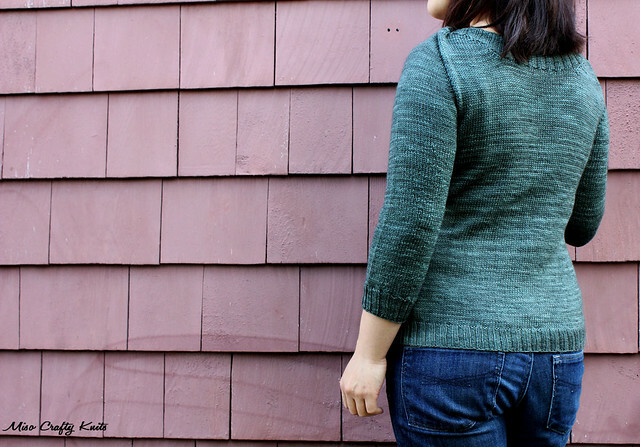 I finished this pullover last month and even though the finishing on it was very minimal, I had a really hard time getting pictures of it. By the time Brett got home it would be too late and the lighting in our house would be horrendous. I still can't find the remote to my camera, and I can no longer take photos in the place where I usually take photos because after 3 years we finally put our headboard back on our bed (we kinda feel like adults!). The search for a new backdrop is on. For now, it'll have to be outside...with a background that, in hindsight, I now think compromises the actual colour of the yarn. Meh. Lately, I just can't win. While I was knitting the shoulders I kept questioning the weird "bunching" I was getting but thought I would plow through and just trust Miss Veera...and hoped that a good blocking would sort it all out. Well, post blocking and the shoulders do look better. From the front. But if you look closely from behind you can see some funkiness going on. To me it looks like the shaping was made for someone who has slender and somewhat boney shoulders with prominent clavicle bones. I, on the other hand, have round and thick shoulders and I know there's clavicle bones in there somewhere cause you need them, but you can't see mine! I was a really bad knitter in this project though...I didn't alternate skeins...shhhhh! I don't think you can tell too much, but there is noticeable pooling action happening on the chest. Can you spot it? 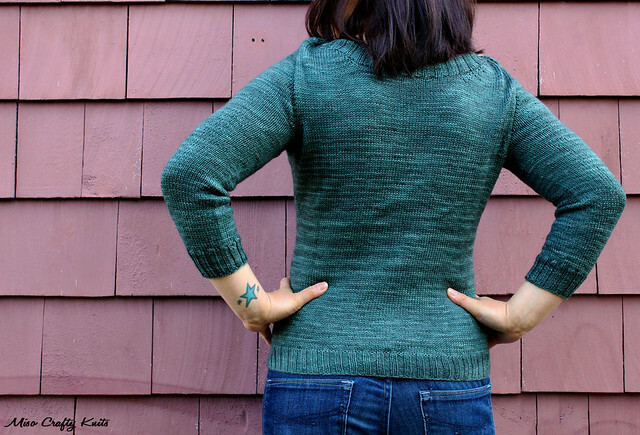 I'm still surprised that this entire project only took a little over 2 skeins to knit up! Seriously, I only dipped into the third skein to knit one of the neckbands. I am in no way losing weight or getting skinny, so I have no idea why I'm using less yarn all of a sudden. Maybe I'm shrinking in height already? I did just have a birthday and therefore am a year older, maybe I lost an inch in height? 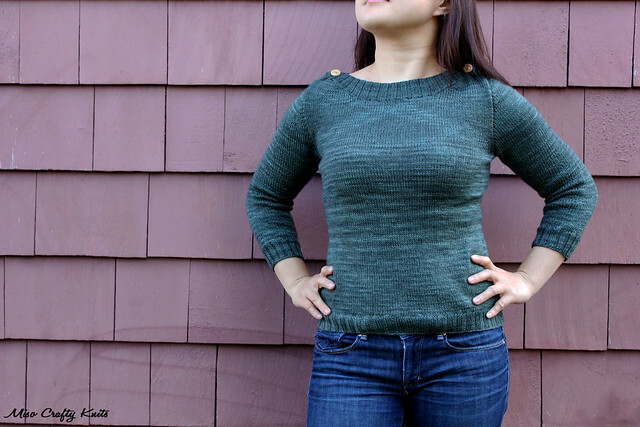 I thought this pattern was quite an easy knit and I think any newbie or knitter dipping their toes in the garment department could knit this up with no problems. I would love to knit this again and can already pick out the yarns I have in my stash that would make wonderful Buckwheats. 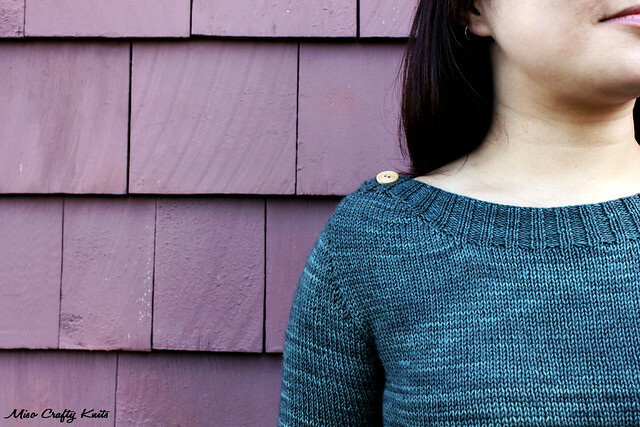 I'm pretty sure I don't have to tell you how much of a fan I am of Veera Välimäki's designs, but she has so many others that I'm just dying to knit up that knitting a second will just have to wait. I think this design is a classic and would make a great addition to anyone's wardrobe. I think the boatneck is very flattering and looks wonderful on all body shapes. I wouldn't make any modifications to the pattern the next go-around, other than to change the shoulder shaping a little at the back to avoid the funky bunching that I got. So...who else has this in their queue? Or better yet, who has knit this up already? Did anyone else get weird shoulder action too? Did you cut your hair!!!??? Yes I did! I had cut off well over a foot of hair about a month ago! that looks great! but yes it looks like it's too big across the back. do you perhaps have a narrow back? also, looking at the FO's on ravelry, it seems to fit better with 0 ease than with any sort of ease - the shoulder seams really appear to bunch if it's too big. Some colours are so hard to photograph. It frustrates me no end. 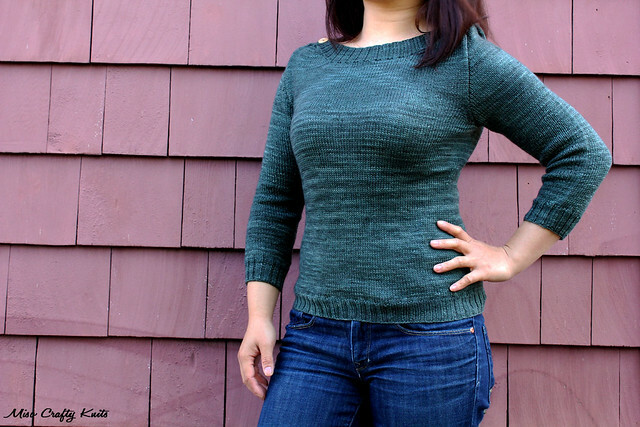 Gorgeous pullover! My husband tells me that I am shrinking. I bloody hope not. I think he is just growing. It kills me when I can't get the colour right. I feel like I'm not doing the yarn or the project any justice! I recently discovered your blog and just wanted to drop you a comment to say how much I enjoy it. Your writing style is so engaging, and your notes on patterns like this one are very helpful, especially for a mostly-beginning knitter like me! And that's to say nothing of your stunning photography. I'd love to see your whole stash, someday! Anyway, just wanted to say keep up the great work! You inspire me! Love it! So purdy on you!